Sarah Palin wore red Naughty Monkey Double Dare Pumps when John McCain announced her as his vice-president running mate (source). Let the press run her down all they want, but I like her style (her shoe style anyway). I’m still undecided on my presidential choice. 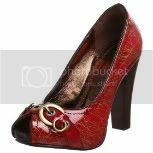 Red Naughty Monkey Women’s Double Dare Pumps were available from Endless.com, $86.90. Also available from Amazon.com. Get Sarah’s Look for Less with Mossimo Danae Buckle Red Pumps, only $26.99 from Target.com (search “danae”). You can find Naughty Monkey Pumps for the best price on Amazon.